Sources and perspectives that bring an expansive history of western civilization to life. Sources of The Making of the West helps bring the history of the west to life. Thoroughly revised and designed to be used independently or as a companion reader, this two volume collection parallels the major topics and themes covered in each chapter of The Making of the West. A broad range of source types and themes illuminate historical experience from a diversity of perspectives. Now with a visual source and a comparative source pairing in every chapter, this reader offers instructors even more opportunities to promote classroom discussion of primary documents and to help students develop essential historical thinking skills. 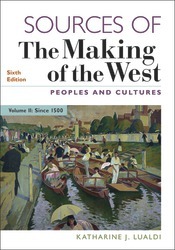 Sources of The Making of the West is FREE when packaged with The Making of the West, Sixth Edition or when packaged with The Making of the West, Achieve Read & Practice. It is included for FREE in the LaunchPad for The Making of the West.